Welcome to the Writers SuperCenter, where you'll find Software for Every Kind of Writing! Also see our Script Formatting Software, Poetry & Songwriting Software, and Religious Software. Muse Software turns you into a master communicator on two fronts: a creative writer of all kinds of stories (from short stories to novels) and an eloquent speaker/storyteller! In short, the Muse gives you the power to generate ideas, write, speak and lead with confidence. This powerful software suite will assist you in developing ideas into blockbuster fiction or world-class presentations and honing your skills in crafting great stories or delivering impressive speeches and presentations. We've assembled key fiction and general communications tools to provide you with an unmatched solution for enhancing and improving your communication skills. Not only will the Muse help you write blockbuster novels and other kinds of fiction but also to become a better, stronger and more confident communicator, able to translate thoughts into words, books, and presentations that will dazzle the world and lead to success, promotions, action on the part of the readers/listeners, and increased sales for the entrepreneur. If you don't know it by now, world-class fiction and non-fiction writers, storytellers, and speechwriters use world-class tools. And the Expert Writer module is, in itself, a must-have writing tool for those in need of inspiration, creativity and story-building resources, all of which go into creating great novels and other stories as well as making great presentations. There is no better way than through Muse and its Expert Writer to help you create and manipulate words. 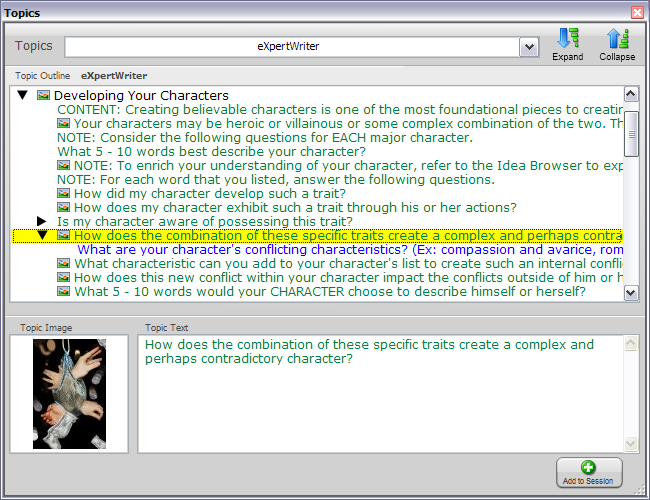 The Expert Writer module contains hundreds of questions and prompts created by successful writers of fiction and non-fiction, and distilled down for your use, 24/7. Imagine it. A proven collaborator who never tires, never sleeps, at your beck and call. That's The Expert Writer. 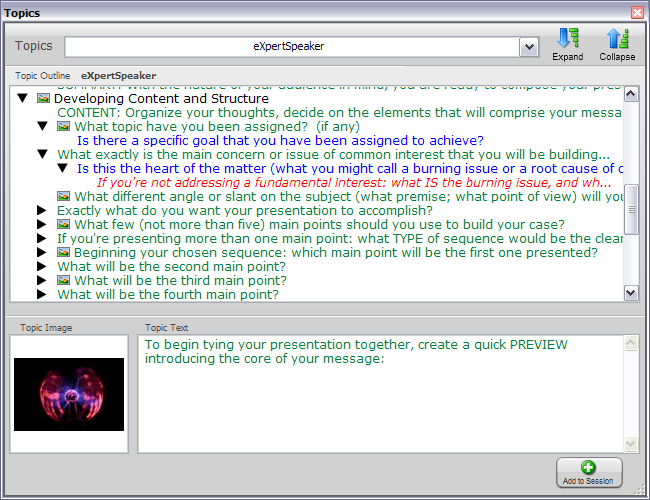 The Expert Speaker Module helps you to prepare, write, and deliver persuasive, energizing speeches and presentations. This module can be used to quickly prepare for any kind of speaking situation you'll ever be in — both within the corporate world and outside of it. The questions and guidance contained in Expert Speaker are the result of many hours of interviews with successful speakers and presenters. We got them to tell us how they create great presentations, from start to finish, then condensed their years of experience into one comprehensive resource. Used by successful executives and presenters world wide, Expert Speaker is their "secret weapon� for developing effective speeches that are both well received and have a lasting impact. Happy 17th Birthday Writers SuperCenter! Writers Software SuperCenter is the longest-running website on the Internet devoted to selling software for writers. After your first purchase, take $5 off every time you purchase any products from us! Mama or Papa Berent will answer the phone! We're the owners... and we're LIVE!